In honor of my sweet friend Annmarie's birthday tomorrow, I offered to make her a special treat. When she told me that her favorite flavors are chocolate and raspberry (mine too! ), I knew I had to make this Double Chocolate Layer Cake from Gourmet magazine with this raspberry filling. This is quite the famous cake recipe, and one of the reasons I chose it was because the feedback (both on Epicurious and Smitten Kitchen) was overwhelmingly adoring, bordering on cake worship. I'm an old pro at boxed cake mixes, but this was my very first layer cake from scratch. I had the best time making it, and I definitely learned a lot in the process, like what ganache is... though healthy Amy wishes I didn't know that! 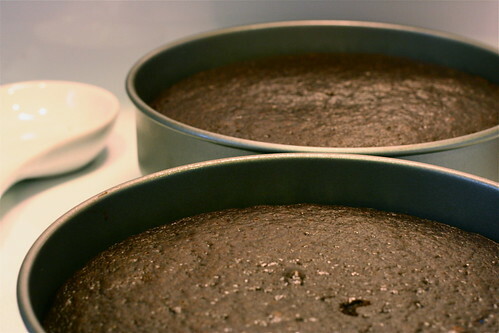 I modified the recipe a bit to fit my 9" round cake pans (the original recipe calls for 10"). I had enough batter for 2 cake layers and 12 cupcakes, which I injected with the filling before frosting them with the ganache (thanks Mom for teaching me how to do that!). I baked the layers for 45 minutes and the cupcakes for 20. I'm planning on starting a tradition of baking for my friends on their birthdays. Why didn't I think of this sooner? After assembling cake with raspberry filling (below), spread frosting over top and sides. Cake keeps, covered and chilled, 3 days. 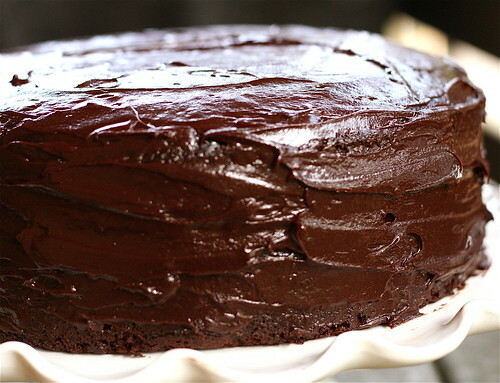 Bring cake to room temperature before serving. Take raspberries out to thaw while you prepare the ganache. Once thawed, puree raspberries in a food processor, blender or immersion blender. Press the puree through a fine-mesh strainer with the back of a spoon or rubber spatula, removing the seeds. 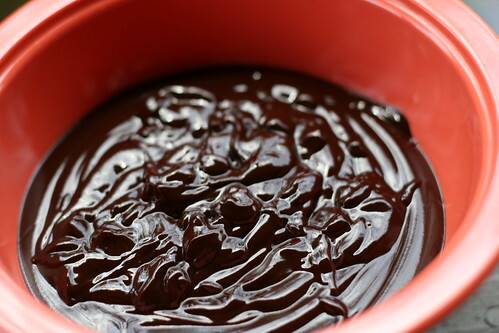 Heat the puree in a small pot with the sugar and cornstarch until mixture boils, stirring constantly. As it boils, it should quickly thicken. 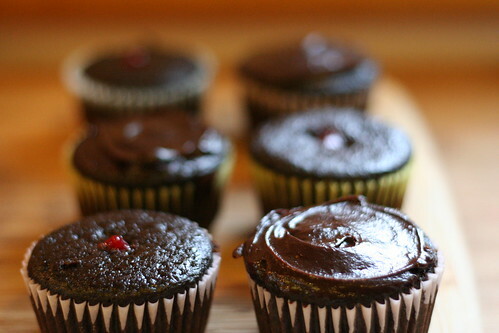 Let it cool complete before spreading it thinly over cake layers or piping into cupcakes.